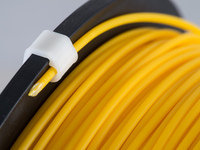 Creality CR-10 MINI Strain relief bracket for heated bed cable by Olesmokie is licensed under the Creative Commons - Attribution - Non-Commercial - Share Alike license. This is a remake of Greg191134 Creality CR-10 Strain relief bracket for heated bed cable but for the CR-10 Mini. I completely redesigned the bracket to suit the slightly larger cable and clip on the CR-10 Mini. I didn't actually use Gregs files but took inspiration from his design. This an accessory for the Creality CR-10 Mini 3D Printer. 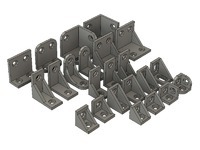 The purpose of this bracket is to hold the wires for the heated bed in place to avoid that they wiggle when the bed move which would ultimately lead to breaking the welds or the wires. The bracket is designed to be installed on the far left screw under the spring as shown on one of the picture. You will typically need to remove the glass bed for that. 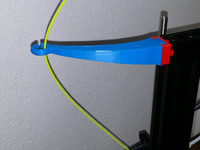 The bracket does not touch the heated bed and can be safely printed in PLA. Once the bracket is in place, move the wires a bit toward the bed (to avoid to put too much tension in them) and hold the wire in place with 2 zip ties. Support only needed from build platform only. After a friend said they had problems getting the cable and cable ties in I increased the clearance. Say thanks by giving Olesmokie a tip and help them continue to share amazing Things with the Thingiverse community. We're sure Olesmokie would love a Tip, but unfortunately they have not setup their accounts to receive them yet.